This botanical sample, along with AA-8718, was originally reported as being maize by Riley et al. (1994), and dating to the Middle Woodland period. 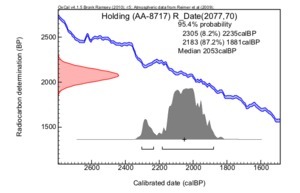 A new sample from the specimen was recently re-analyzed to measure the stable carbon isotope ratio (𝛿13C), since this measurement was not included in the original analysis. This new analysis revealed that the material is from a C3 plant, and not a C4 plant such as maize, since the 𝛿13C value was -26‰, and therefore much lower than would be expected for maize (Simon 2017). We include it in this database because it is cited widely as one of the earliest maize samples in the US Midwest/Mississippi region--however, the sample is now not included in the map of maize dates. Non-maize sample originally thought to be maize. 1994 Accelerator Mass Spectrometry (AMS) Dates Confirm Early Zea Mays in the Mississippi River Valley. American Antiquity 59(3):490-498. 2017 Reevaluating the evidence for Middle Woodland maize from the Holding site. American Antiquity 82(1):140-150.